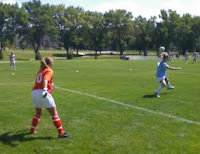 On Sunday, Auguest 31, CSM and Dakota Wesleyan battled to a 1-1 tie. Katie Archibald scored about halfway into the first half from a nice through ball from Melissa King (or "Kingy" as Neil has been calling her lately.) Katie placed the ball nicely past the keeper with the blue mohawk after King sprung her free into the box. In the second half we gave up a free kick about 30 yards out. We were unable to clear it and DWU was able to tie the score. The rest of the game was back and forth with each team having periods of time with a lot of possession. In overtime it appeared that DWU scored, but the goal was called back for an offside violation. CSM got the best of the shot total 28-11. Melissa King had 12, out shooting the entire DWU team. Archibald, Withey, and Cross each had 4 shots added to King's 12 with 4 others filling in to get the 28 shots total. 16 of those on goal. Swanger had 4 saves, Jones had 4. Swanger made a fantastic save on the line to save a goal. I set my phone to be able to instantly post 2 this blog. I will try to update it from my phone especially if we are on the road. I loved the way practice ended today! We're doing a drill & I told them that if they step it up to the next level, we end early. They steppd up! Overall, a dominating match. Jackie Swanger played first half in goal with Mollie Jones in goal the second half. Next game is at Dakota Wesleyan in Mitchell, South Dakota, home of the Corn Palace on Sunday, August 30th. See you all there! Victory! The Flames put on a big show today in their opening game defeating the Viterbo V-Hawks 4-1. Melissa King led all scorers with 2 goals and one assist. As a matter of fact, King broke the game wide open in the 3rd minute with an unassisted goal smashed to the far post with her left foot. King didn't stop there. Nine minutes later she added her second goal with off an assist by Tiffany Reis who made a monster run forward from the back line. Melissa headed Tiff's cross, it bounced off the keeper, back to Melissa and she knocked it in. The first half ended with the score 2-0. CSM had 16 shots to the V-Hawks 2 at the end of the first period. The Flames came out blazing again 15 minutes into the second half. Melissa King made her way down the right side and crossed it to Ashley Turco who headed it past the keeper's outstretch had to put CSM up 3-0. The Flames added a 4th when Katie Archibald beat her player on the left and dribbled deep in the box, she passed the ball across the goal mouth where it hit the far post and bounced right to Sara Berens who slotted it in. Rita Rabb was able to score for Viterbo 8 minutes later on a long distance shot that just barely beat keeper Jackie Swanger's right hand. Goalkeepers Mollie Jones and Jackie Swanger split time between the posts, Mollie beginning in goal the first half and Jackie finishing the game in the second. Jones had 2 saves and Swanger had 3. CSM finished with 29 shots to Viterbo's 7. I told the players after the game that this game should make them hungry for more, hungry to keep improving and fighting to get ourselves to the next level. Speaking of hunger, I think I'll go get something to eat. Make a comment below! The season is about to begin and I am ready to rock and roll. Players come in this weekend and move into the dorms on Sunday from 1:30-3. At 3:15, its a meeting with our new AD, Jim Krueger. After that, the soccer team meets and at 4:30 it is time to eat. This year ought to be incredible. We have added some exciting new players and everyone else has another year of experience under their belts. Watch out! Here come the Flames.